Rocket Bits update #3 was submitted to the App Store yesterday and should be available in about a week or so depending on how long it takes to get approved. By popular demand I’ve added the game’s first enemy character! He’s some sort of red space monster that slowly floats towards the player and does a little damage ( and a lot of damage if you’re out of the ship! ). That also means the game now has health and the ability to die. What fun! In addition to that, the other major new feature is the ability to save your game. You’ll now have 3 game slots to play with and your game will save state when you close the app or quit back to the main menu. The only downside to this is that there isn’t any logic for regenerating gold, platinum, or gems… so once they’re gone, they’re gone. Any suggestions on how to handle this? Should we just randomly respawn more as time goes on? What do you think should happen if the player destroys every single block in the game?! Just things to think about that we’ll need to address at some point. There’s also a new mission type dealing with killing the new space monsters as well as the ability to zoom the mini-map. Thanks for being patient with me and my slow progress on everything! Hopefully you guys have fun with the new update! Wow! the alien looks awesome! Sweet! Glad you like how they look! These are just the first ( and pretty dumb ) enemies, but now that the system is in place, it should be easy to add more ( smarter ) enemies in future updates! N as far as regenerating your gold n whatnot, what if you made a level progression type thing? Once you collect everything, you start a new game, catch to that is tho, you just generate a new leve with the level generator, but you keep the gold, gems, and platinum? (can’t remember if that’s that’s what it’s called, haven’t had time to pick the game up) that you collected b4 and are able to purchase bigger things from shops and such. Let me know your thoughts about this please, I’m interested in hearing your feedback. Thanks, n I haven’t said this b4, congrats on the baby brotha! @Tom that would definitely be be as easy way to do it ( and easy is good! haha ): just start a new level with your current gold, gems, and platinum. And a store is for sure in the works that will let you purchase items and maybe upgrade your ship / abilities. @FortyKingTreason Would the air pocket be kinda like a portal to another world? That might play into Tom’s suggestion as well… maybe the player can purchase portals to place in the world and use those to jump between worlds? I would like to dig into another world. Then again, having to purchase a portal would put that gold to use! But I would still rather dig to another world. You could use the gold to purchase better equipment, or different rockets. I would still love to have a multi-player, were there are other ‘Rocket Bitter’s’ who you can see in real time, and fly around with them and crash with them and talk to them. That is probably really complex to create though. @Kaleb yea, multiplayer will definitely be a big task… but hopefully I’ll get that in a some point since it would be super fun! Are you saying that multiplayer is a possibility? That would be so amazing! I like what I’ve been reading multiplayer sounds great! As far as air pockets n portals n such, those sound good to me. You can either use an air pocket to get to another spot, or buy a portal to go to a much better area that has things such as extra gold or platinum or anything really. Basically a bonus room type thing. Dude this is really cool. What’s also cool is that apple lets you put up a free beta that you can then change to $1 later on when it’s finished. I thought that wasn’t allowed. Definitely going to be watching this project and after I played a bit (installing now), I’ll fire off some suggestions too. @Snow haha, that’s actually a great point: I was just assuming in my head that I could change the price later on… maybe I can’t. I probably should have looked up Apple’s policy on something like that before I made that claim, heh. I guess we’ll just have to wait and see! I really like the new update! Maybe with the portal/new level idea, you could have multiple alternate parallel realities (one with different physics, one with different monsters, one with npcs)- and by finding the secret portals, you could progress to new areas through the existing worlds, slowly discovering an entire universe and maybe even finding items/bosses/subtle hidden mysteries about how it all fits together along the way! PS: since apple allows some apps to go free temporarily, and also price hikes, the price thing should work. ^^^ Also, for some reason the game always crashes when I go to generate a level Could you please look into that? I have a 2nd Gen ipod with IOS 4. Obviously, not being able to play it at all is a bit of a problem, but it’s hopefully a minor fix and I WILL NOT delete Rocket Bits. It looks too fun! Congratulations on the baby! I wish more developers would do stuff like this. It’s a really great system and I hope Rocket Bits gets a lot of positive attention for it! You are awesome! @Kaleb Woot! I’m glad you like the save slots… they were actually a little challenging to get into the game, so I’m happy you appreciate them. @Kal Oh no! I’m bummed that it’s crashing for you. I’ll see if I got a crash report from Apple and hopefully that will tell me what’s going on. In the meantime, can you try restarting your device and see if it’s still crashing after that? Also, thanks for the kind words and great ideas! Howdy! I just discovered Rocket Bits via the recent Touch Arcade article. So far I’m having a blast with your game! 1 – I like the idea of rescuing lost/stranded space travelers. I picture a scenario where you stop at a damaged looking ship, perhaps with a smoke effect rising from a broken hull. You could “Talk” to initiate the mission, their ship would fall over & little people would start spilling and spreading out. By landing your ship near them, they could “climb aboard”. There would obviously be a time limit on how long they would survive without oxygen, so you have to grab them quickly. You might also accidentally land on them & crush them. Oops. After you’re done, deliver the survivors to a Space Station & get gold rewards based on how many you’ve rescued. 2 – Space Station – not only would this be a location for delivering stranded space travelers, this will be the store. (And I’m sure you have tons of ideas for the store/upgrades already, but here are mine.) Upgrading/Repairing the ship would be swell – increasing the strength of the hull so that accidentally knocking into the environment wouldn’t damage you as much. (Also, I think the ship should currently be taking more damage when you hit rocks.) Upgrade the spaceman’s armor – even if it’s just enough to withstand one brief contact with an alien when outside of the ship. 3 – Establish your own “Base”. You could collect enough gold/resources and buy a Terra-Form kit at the Space Station. You pick a spot in the environment and make your Base. Gradually, the environment would begin to change – more/different resources would appear & possibly an oxygen-rich “bubble” would form, allowing people to walk around without dying. The color of the environment would change to reflect the progress. Maybe you could even deliver the stranded travelers here to live on your base. Or hire them from the Space Station. They could mine resources for you or defend the Base. 4 – As a part of establishing a Base, you could build or set-up Turrets to automatically defend against aliens/enemies – sort of a tower defense type of aspect. Once your Base reaches a certain size, aliens/monsters will be more attracted to it. Perhaps then you could initiate some sort of old-school Missile Command type of mini-game where you would draw lines from your Turrets to the aliens, blasting them from the sky. All of these upgrades & turrets would be based on how many resources you’re collecting. 5 – A mini-game where you Race your ship through a tricky/narrow corridor. You could set a time goal at first – like get through the tunnel in under 60 seconds / 45 seconds / 30 seconds, etc. You would win gold/resources for better times &/or making it through the course without hitting anything. This is also something that could eventually be a multi-player aspect – race against other people’s times, or better yet, race against them in real time! 6 – I like the idea of having to mine for some of the resources. You could indicate that certain resources were buried in the environment & have special bombs to reach them. 7 – As a part of the mining component, I think adding dangerous space Worms that are released when you’re mining would be fun. They could be somewhat slow moving at first, so that you have time to formulate an attack, but then they would start moving quickly. 8 – Allow players to name their ship & their character. There’s just something that binds you to a game when you can customize it a little bit. Okay – that’s all I’ve got for now. I do feel like you should set up something so that people can show you their support by sending some money. Kickstarter? Even if you just establish a PayPal connection, I’ll bet you’d start seeing some money trickle your way! Again, I’m really loving it so far. I’m excited to see where it goes next! I like the idea of rescuing fellow astronauts, perhaps add some urgency to proceedings by have them surviving on limited air supplies. @swatagnat Wow! Awesome suggestions! Thanks for all the detail too, it really helps to have specific ideas to implement! The store is probably going to be in the next update and I really like the idea of making it attached to a physical base in the world… done deal. Customization is next on the list. Even simply adjusting the colors of your ship / spaceman would be very cool. Additionally, another player had the idea to possibly change the world colors depending either randomly when the world is created or maybe tied to some part of the generation code. For example, you might get a world with green bits instead of the current reddish look, and the sky might be bluer to represent the presence of an atmosphere. One other question for you guys: There have been a lot of suggestions for ship weapons. What are your thoughts? If we did go with that idea, how might the control scheme for that work? Ship Weapons – I think the easiest (?) way for the ship or the spaceman to have weapons beyond Bombs would be to implement some sort of “hover” mode. Push a button on the screen and your ship/spaceman just hovers in place while you utilize a gun of some sort. Hit the button again and you regain control. I can’t think of how it might work otherwise, since you need both “hands” to control the thrusters. OR – you could draw a line from the ship/spaceman to the enemy you want to shoot & then push a “gun button” on the side of the screen. This way you would only lose “control” for a brief time. At first, your gun would only shoot towards the place where you originally draw the line. After buying an upgrade in the store, your gun could “lock-on” to a target, allowing you to continue shooting it while moving around. I would want some sort of ram, to make tunnels, instead of banging into the reddish stuff and removing 3 pixels at a time. It could also be a drill. Something else that would be kinda cool is the spaceman could have a little pet, or maybe even a shovel! I like that idea! A shovel could remove pixels too, but slower than the ships drill/ram. Ship/spaceman weapons control scheme. Use the context sensitive menu to select weapons/items. 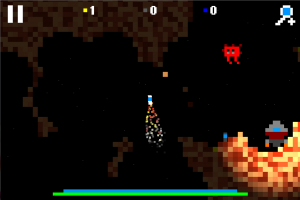 Machine gun – auto fire so player is free to control the ship. Projectiles – missiles for example would auto target the nearest enemy in range. Mines – could easily be deployed behind the ship. If there are going to be a lot of weapons and items to select the context menu could become quite cluttered, I presume you wouldn’t want sub menus. Perhaps at the start of the game and before a respawn the player can select their loadout, the weapons would be divided into different classes so the player can select one weapon from each category before the game starts. The categories could be light, heavy, special. I definitely like the idea of the weapons doing most of the work themselves so that the player doesn’t have to give up a lot of control of the ship. What does everyone think of Ken’s ideas? They seem like potentially the simplest scheme as well as easiest to implement. I too think that the weapons, whatever they are, should be sort of self-working. I like Ken’s idea of choosing your loadout after you die. If there are going to be a lot of weapons/items it could be good to save your custom loadouts. So you can quick select your favoured set up before each game. I only judt discovered rocket bits in a completly random way. I was wondering if you could add in a gun/gun-like feature into the game, it doesn’t have to be too powerful just a medium damage weapon. You should also make the world randomly keep on spawning so it doesn’t end. I have been playing your game for a few days now and I love it! There are a few suggestions I would like to make. Han held weapons -It would be cool if when your astronaut gets out of the ship he could hold a gun. You could tap the enemy to shoot it. Then you could by ammo or new weapons in the shop that was talked about above. Air and water – You could put in air tanks bought in the store witch fill a certain amount of blocks with air. The astronaut would not have to get air from the ship. If this air is near the ground, it could have an effect on it. Or you could buy tanks of water and place it in an air pocket and the land will go to a normal or earthly state. Building – You could buy materials such a metal from the store witch allow the astronaut to build by placing the materials. You could build a space station. This would be a good spot to put an air tank. There could be a button witch allowed your spaceman to walk left and right instead of flying. This would also make it easier to build and place bocks by touching the screen were you want the blocks to be placed. Repairing – Repairing your ship would be very helpful. If you have been playing a long time and have many resources, you don’t want to die and loose everything you have worked hard for. Repairs could be in the shop. There would be and item that might look like a wrench. Inventory – There could be an option in the “action” menu labeled inventory. This is were you could store all of your items in. Like the repair item. Tools – There could be a claw that could come out of the ship to get materials. If you tap the screen on a block it claw will go out and grab it. Even dirt. Then you could build with it or sell it in the shop. This could work for the spaceman to. Except it would be like a shovel. Movement – There could be a line that shows were to touch for flying. The sections of the screen could be smaller. This would help for battles and weapon use. You could simply tap the enemy as long as it is not in the section of the screen used for flight. Chests/ safe houses – You could store your materials in these things. They would be bought in the store. If you die, the world code is saved in notes, and you have your items in the storage unit, your could retrieve your world as you left it. I hope this will help on your game!